You may have noticed we have recently joined Facebook! If you are not yet a fan (why ever not!?) then click here to head over to our page and like us! 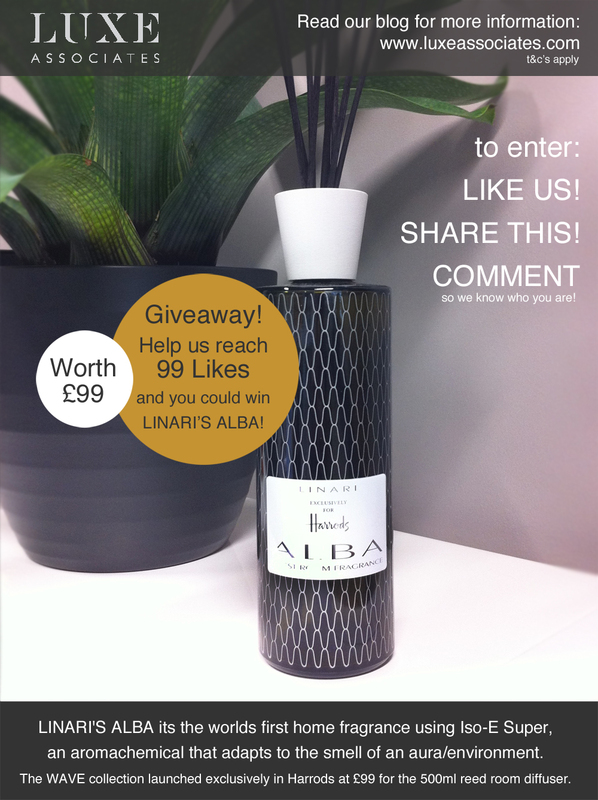 As a thank you to all our fans who help us to reach 99 likes we’ll be giving away a LINARI ALBA home fragrance diffuser, which is exclusive to Harrods and worth £99! LINARI’S ALBA its the worlds first home fragrance using Iso-E Super, an aromachemical that adapts to the smell of an aura/environment. ALBA is part of the LINARI Home Collection called “WAVE”, a reference to the unique bottle design. Style and Opulence – Fruity accords of fresh mango, juicy tangerine and blackcurrant merge with the floral opulence of Turkish rose petals and French cyclamen. These are silkily flattered by the seductive and subtle woody notes of Iso-E super and cashmere wood. The multifarious base note is determined by a delicate bouquet of Atlas cedar, musk, Haitian vetiver and a soft touch of powdery tonka beans. The WAVE collection launched exclusively in Harrods at the retail price of £99 for the 500ml reed room diffuser. Once we hit 99 likes we’ll pick one lucky Facebook fan at random as our winner! Fans who share and comment on our giveaway post can increase their chances of winning! The winner will be required to send us a photo of the Linari diffuser in their home.